You now live in New York. What made you move there? I was accepted to study drama at The American Academy of Dramatic Arts (AADA), which was an ambition of mine at that time. I had studied with the Guildhall School of Speech and Drama since I was a child, and thought it might be interesting to explore further learning opportunities in New York, rather than London, as I had lived in America for several months when I was seventeen and loved it. Alas, after only a term, the harsh realities of the acting world deterred me from continuing along that path, as I found that I was far more interested in how plays were constructed from an authorial perspective—why the lines were written, what they meant, the motive of the pieces—than in the actual performance of them. I then decided to put my degree in English Literature to use and applied to Random House for a job in publishing. You began your career as a book editor at Random House. Did you enjoy your stint there? What kinds of books did you edit? I was very lucky in that my first job as an editorial assistant was at a prestigious literary imprint, Doubleday Broadway, where I came into first-hand contact with such authors as Gore Vidal and Muriel Spark, who were being published there at the time. When you’re in the presence, however removed, from writers who have, justifiably, been lauded as geniuses, you learn an awful lot about how things should be done. I am grateful for the experience: it subsequently informed everything I ever attempted as a writer. As I moved up the editorial ladder, I edited a cross section of novels: literary fiction, historical fiction, commercial fiction. A little bit of everything crossed my desk, which was unusual as editors usually have a specialised field, but I was fortunate to be able to dabble in different areas. As a consequence, I learned a tremendous amount about what makes a story work and how to position novels to their respective audiences. What is it like when an editor becomes an author? Do you find difficulty adjusting when the shoe is on the other foot? What are some of the most important things you learnt as an editor that has benefited you when writing your first novel? I think that what any former editor who becomes an author brings to the editorial desk, albeit from the other side, is an acute understanding of how difficult the process of being published actually is and, as a consequence of that, a determination to be as easy as possible for an editor to deal with! I was so happy that, despite a challenging publishing climate, I had managed to get my foot on the authorial ladder, that I simply wanted to enjoy the path to publication. The greatest lesson I learned as an editor that may have benefited my writing was the art of ruthlessness in terms of characterisation. A fundamental—and I believe crucial—awareness of how to realise a novel to its maximum potential that begins, and arguably ends, in a negation of the ego on the part of the author and cold-blooded, dispassionate ruthlessness in terms of characterisation. Too often, I witnessed books with great potential fail and, in returning to the reasons why, a familiar cause would present itself: the hero or heroine was often a thinly disguised, invariably exalted, depiction of the author him- or herself. I witnessed many authors ruin their work by succumbing to authorial preciousness, interpreting editorial suggestions made to balance the character as a personal attack. The objectivity necessary to remedy the flaws in characterisation proved lacking because they could not separate their own personality from the equation. In short, they believed the character and, by extension, themselves, to be flawless, despite idiosyncrasies that would ultimately prove off-putting to readers. Coming up against this dangerous perception time and again ultimately proved the cautionary lesson I have never forgotten, which is why none of the characters in The Art of Devotion bear any relation or resemblance to me. I am entirely dispassionate about all of them, and approach them as a reader might, judging them accordingly. What made you decide to leave publishing and pursue your literary ambition? Do you write full-time now? I found myself working so closely on certain novels that it was almost as if I had, in fact, written them myself, which gave me the confidence to attempt to write a novel from scratch. I took a year off from work and wrote two pages a day for five months, and at the end of that period I had a first draft of my novel. That was the beginning of it all. I’m lucky enough to be able to write full-time now, which is a dream come true. Was writing something you had always set your heart on? I had no designs whatsoever on becoming a writer. During my university years, I truly wrestled with my prose style and was consumed with self-loathing, ripping up half-written essays and starting all over again all the time. In my final year at secondary school, however, we were called upon to submit four short stories for our English exam, and they attracted some attention from the teachers. And that was the first time anyone had ever complimented me on my writing, but it didn’t register with me, beyond a nice thing to have happened. I adored reading, but I had such admiration for my favourite authors that I had no confidence to try it myself, and, in fact, I wrote nothing creative until I arrived at Random House four years later. It’s very surprising to me that I ended up pursuing this career path because now I cannot imagine ever finding such fulfilment in any other profession. What do you enjoy most about your life as a writer? Those “Robert Redford” moments that can occur from time to time. When I truly hit a high note with my writing and it settles on the page, just so, into something that I consider perfect, it’s like watching Robert Redford seamlessly execute one of those intoxicatingly memorable scenes of his career; something simply beautiful to behold. I aspire, daily, to such moments and am in a glorious mood when they do arrive, if only so that I can acknowledge his influence anew. What’s a typical day like in your writing life? I start writing at around 7:30am, and that’s where I remain until around one in the afternoon, if not longer. For me, it’s all about discipline, although I do dither about a lot—pacing figures quite prominently in my routine, as does indulging my loathing of the Internet with its manifold distractions. As I’ve written more, I have learned to be more forgiving of myself, and I recognise that some days are more creative or productive than others. Even if I cannot find a thing to write, I usually generate an idea or feel so frustrated that I am impelled to try even harder the next day. What I have found, however, is that I am always, to some extent, writing, because I never stop thinking about the story I am working on. Even when the computer is switched off and I’m officially “finished” for the day, the work continues, mentally. 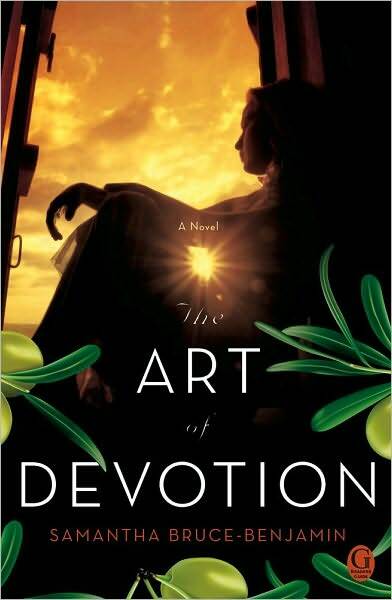 The Art of Devotion was inspired by F. Scott Fitzgerald’s The Great Gatsby. What is it about this classic that inspired you to write your first novel? I find it funny—but extremely flattering—that reviewers have drawn this comparison. The simple truth, however, is that I did not consider the literary classic during the entire process of writing The Art of Devotion. It was only later, when I had to conceive an epigraph for the front matter that I thought to include the final line of Fitzgerald’s masterpiece, which seemed to encapsulate perfectly one of the central themes I had attempted to explore in my novel, that is, each character’s inability to escape their respective past. On publication, however, I was given an extraordinary review by The Examiner, which favourably compared me to Mr. Fitzgerald, and, as a consequence of that, many have suggested that I was influenced by him. Obviously, as he is my favourite author, and The Great Gatsby is my favourite book, he is an inspiration to me, but I did not make a conscious decision to attempt to replicate his narrative style: I would never have thought myself capable, for a start! It is fascinating to me, however, how an author’s influence on a writer can filter into the work, quite unwittingly, almost by a process of osmosis. All authors, it seems, are the sum of the parts of their predecessors to which they add their own unique voices; it’s a wonderful debt to owe to our literary forebears. I am certainly, very happily, indebted to Fitzgerald. Was it difficult getting your first novel published? It did take around three years to find a publisher, but I wrote another novel during that time, so I never felt as if I was sitting still. Initially, I was represented by an agent in London, who sent out a first draft that was very nicely received, but a near-miss in terms of securing a publishing deal. I then proceeded to write another novel, but I simply couldn’t shake the feeling that I had not served The Art of Devotion well by putting it aside. I returned to it two years later, and completely revised the story over the course of the summer of 2008. At that point, the manuscript went out on submission, and was sold to Simon & Schuster shortly thereafter. Did you know where you were going with the novel as you were writing it? From the beginning, I had an unformed thought that kept playing in my mind: “For each of us, there is a moment. What we see at the last ...” Yet, what it meant, and how it would translate into a story, mystified me. It was three years until that sentence evolved into a theme unto itself, and became the opening line of the novel: In the first draft, I didn’t even include it. The original title, “The Art of Malice,” however, was in place from day one and guided me forward thematically. Alas, the title was changed for the American edition, which, sadly, sometimes happens. When I think of the novel, however, I always allude to it as “The Art of Malice”: I suppose because the title was with me for such a long time. What are some of the themes you explore in the novel? The two themes that dominated my thinking as I wrote The Art of Devotion were “perception” and “exile.” As a European living in New York, I often feel as if I am writing “in exile,” in that I am so far removed from the landscape of my youth, which I dearly loved. As much as I enjoy living in New York, I have never considered it home, although I have lived here for over a decade. So, in conceiving The Art of Devotion, I indulged in a game of mental travelling: I wanted to revisit that Mediterranean locale, and re-examine its culture through a prism of detachment, which is why the four female protagonists narrate their experiences in the present, looking back to the past: all are exiled from the lives they once led. In addition, I have a long-standing love of the sea, and islands, such as I have known in the Mediterranean, have always struck me as being governed, to some degree, by the whims of the Gods; there’s something precarious about their unparalleled beauty, almost as if they could be consumed by the sea at any moment. Onto that stage, I wanted to place characters who, by their very nature and existence, inhabit a world in the late 1930s, from our contemporary perspective, that we know is inherently fragile; a world so rarefied and refined—of grace and favour and privilege—that no longer exists. Most crucially, I wanted to present an idyll into which any reader could escape, almost like a holiday itself. Yet, within that brightly lit framework, I wanted to examine the shadows founded on two further themes: the nature of gossip and idolatry, which, I believe, are inexorably linked. By creating a novel around four distinct voices and examining the same set of events from each different perspective, I was able to play with the idea of unreliable narrators and readers’ allegiances: the characters present themselves without authorial interference, in a sense, because there’s no third-person narration. All the reader knows is what they are told by the characters themselves, in their own voices, and it is entirely up to the reader to decide whom they choose to align their sympathies. There is a quote by Anais Nin, that I found myself thinking of often during the writing of the novel that asserts: “We don’t see things as they are, we see things as we are.” I think it’s a very powerful and compelling insight. I also wanted to examine universal emotions with which readers would readily identify: grief, love, devotion and each character’s divergent approach to them. Most crucially, there’s no authorial judgment throughout the story: I want readers to believe what they choose, to align their affections accordingly, to agree or disagree with the characters, based only on their own perceptions. Yet, in subverting every single thing the reader believes to be the truth at the end of the novel, I also wanted to cast doubt over the blithe assumptions we ritually make: do we believe what we hear or trust what we know and, if so, why? That is the question that dominated the writing of the book and I asked it as much of myself as I would of any reader. Was there much research to do? What do you think are the essentials of good fiction? The writing, that is all. I can forgive any flaw of plot if the author’s voice or narrative style proves compelling. I once had somebody rather influential counsel me, “Don’t bother about the writing. It’s not important. Just concentrate on getting the story right.” I’ve never disagreed with anything more viscerally in my life. For me, everything is about language. When I look back to my most beloved books, it’s not the artistry of the novel’s architecture or the facts of the story that spring to mind when I consider why I love them, but those sentences, that, when recalled, seem to encapsulate the entire book and what it conveyed on first reading: the final sentence of The Great Gatsby, “And so we beat on, boats against the current”; A.E. Housman’s “Rose-lipped maidens, lightfoot lads”; and E.M. Forster’s sublime metaphor, “Only connect” in Howards End. Immediately, on hearing or reading such sentences or excerpts, I am transported back into the life of the story all over again. It’s like music, almost. What kinds of literature did you read when you were growing up? I sometimes feel that I was so lucky to have read so many magnificent books during my teenage years that I subsequently ruined my reading life forever afterwards. Nothing has ever truly compared to To the Lighthouse, The Great Gatsby—well, all of Fitzgerald’s works—Mrs. Dalloway, A Handful of Dust, Howards End, The End of the Affair, The Age of Innocence, Portrait of a Lady, Lord Jim, Vanity Fair, The Palliser Novels, A Tale of Two Cities. I could go on and on! In many ways, I wish somebody had told me to spread these classics out over a thirty-year period, so that I could have something to which to look forward. That said, thank heavens for Kazuo Ishiguro, Colum McCann, Alan Hollinghurst and Louis de Bernieres; they keep me going. F. Scott Fitzgerald, Evelyn Waugh, Kazuo Ishiguro, Louis de Bernieres, Edith Wharton, T.S. Eliot, Virginia Woolf, Françoise Sagan, François Mauriac, Honore de Balzac, John Cheever, Graham Greene, Nancy Mitford, P.G. Wodehouse, Colleen McCullough, Alan Hollinghurst, Maggie O’Farrell, Zoë Heller, Colum McCann, Ian McEwan and Gore Vidal, among others. And do you reread books you enjoyed the first time round? I used to. Those were the days! Now, I’m afraid that I have very little time for reading. So, I am selective in what I do read, as I have to be careful. I usually choose a classic novel, nothing relatively modern or written by a contemporary author, because I find it terribly difficult to have another author’s voice in my head while I am working on something. It’s actually one of the things that I have not enjoyed about becoming an author—my inability to concentrate on reading. I was never without a book in my hands, prior to becoming a writer, and I have probably read about ten novels in the past three years. I do feel the lack of having that outlet. I buy books, however, all the time, so I have a huge stack to work through if and when such an opportunity ever presents itself again! Currently, I’m very much in a Bloomsbury state of mind, probably because I’m homesick: I’m dipping in and out of Michael Holroyd’s Lytton Strachey: The New Biography and Gretchen Holbrook Gerzina’s Carrington: A Life. I’m also rereading Nancy Mitford’s Love in a Cold Climate, which is too divine for words, as ever. I’m deep in the throes of editing my latest novel, The Last Party, so reading is something like the promise of a ship on the horizon to a castaway, an awfully long way off and no guarantee of rescue. In your opinion, is creativity or imagination something that can be taught, or is it inborn? As a former editor, I think that you can possibly teach the tenets of plotting and pacing—the architecture of a novel—but the language, the ability to find and express ideas in unique and memorable ways, is something that I don’t believe can ever be taught. The interplay between the life of the mind and the way in which it translates itself into language on a page is, for me, an innate gift, unique to each writer. I think there comes a point where language and plotting can be overworked, especially in workshop settings, hitting formulaic marks that, counter-intentionally, detract from a piece of writing’s originality. Sometimes flaws are necessary to convey the author’s intent; sometimes they are what make a novel interesting: I don’t think any author can score a perfect ten every time they set out to write a book, which is why, when it does happen, it’s such an extraordinary feat. Are you working on a new novel at the moment? I have just finished writing The Last Party, which focuses on the ‘last party’ of the summer season, held by a fabled society hostess in the Hamptons, as it unfolds in the moments leading up to the Great Hurricane of 1938. Not having to think about writing! In all seriousness, if I have the opportunity, I could watch the sea for hours, and all of my favourite films, over and over again. Beyond that, I very much like to eat. Especially meringue!